41/48 Kim Hollis I love Chris Rock, but not his movies. 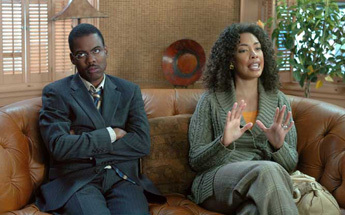 You may not remember it, but Chris Rock made his directorial debut a few years back with the comedy Head of State. Since then, he's moved on to greater things, most particularly the creation of the marvelous little television show Everybody Hates Chris. If you're not watching it, it's worth a half hour of your time to check it out. Rock returns to the directors chair as he works from a screenplay he co-wrote with Louis C.K. He also stars as a gentleman who finds himself, to quote a golden oldie, torn between two lovers. Nikki (Kerry Washington) is the free-spirited girl who is the perfect ideal for the daydreams of Rock's character, Richard. Trouble is, he's married. His lovely wife, Brenda (Gina Torres), might be the woman of his real-world dreams, but her preoccupation with her job and coordinating the schedules of their children has made her inaccesible. See the latest developments for this project on the I Think I Love My Wife Movie News page. Screenwriter Chris Rock, Louis C.K.